Percutaneous electrical stimulation, where very mild stimulation is added to acupuncture needles, is what is used at our Coral Gables office. Electroacupuncture has been prooven to be effective in relieving pain. It is also employed in treating nerve dysfunction, paralysis, and withdrawal symptoms. 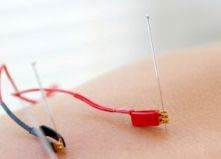 Adding electrical stimulation to acupuncture greatly enhances the effectiveness of the treatment. This will increase the level of pain relief and significantly extend the period of other benefits from the treatment. This method is also known for reactivating neural centers habituated by drug and substance abuse, and enhancing cervical dilation and uterine contractions to induce labor. This stimulation also promotes tissue repair and healing essential to treating many chronic disorders. When cell bodies of nerve fibers are still vital, electrical stimulation can promote regeneration of these fibers. Leads or wires are attached to the needle handle using small clips. This stimulation depolarizes and repolarizes the tissue during each pulse cycle with no energy being imparted to the body, thus causing no damage to the local site of application. The current is kept to a negligible value, with the amplitude only adjusted to the point that the patient can just begin to feel the sensation, or the practitioner observes slight movement. Some paralysis and pain patients may have impaired ability to feel the stimulating signal themselves. Point selection relies on neural and neuromuscular organization of the body. For this treatment distal and proximal acupuncture points are selected for pain, musculoskelotal, tendinomuscular, spinal trauma, neurological impairment problems, herpes zoster, incontinence, and impotence.